OMEGA TYRE PROTECTION CHAINS not only display their full value in preventing tyre slippages but also in addition, serve to comprehensively protect expensive tyres from being damaged by sharp edged rocks and other objects. OMEGA TYRE PROTECTION CHAINS greatly extend life expectancy of tyres and allow for the safe execution of projects. 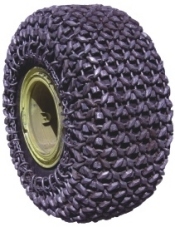 In the case of loaders, for example, where operating costs are greatly influenced by the cost of tyre repairs, protective chains are specifically designed to eliminate extra costs arising from premature tyre replacement. Chains could result in a substantial saving on wear and tear, whilst simultaneously increasing productivity. The extra weight leads to more stability, enhancing greater bucket fill. This directly leads to increased productivity. Clients in granite and marble quarries use protective chains basically for traction and additional weight, with the added advantage of protection.